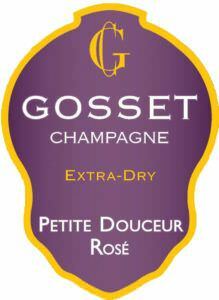 The latest Gosset champagne, the Petite Douceur Rosé Extra-Dry achieves a subtle balance between sweetness and acidity. With a beautiful effervescence — a string of fine bubbles — this champagne is very balanced. The mouth is dominated not only by strawberry and raspberry, but also grapefruit and lemon. Suggested Pairings: The Petite Douceur Rosé’s subtle balance between sweetness and acidity allows many pairings with desserts such as Crepes Suzette, orange blossom cakes, pear tarts with cinnamon, as well as macaroons and fruit sorbets. This is a wine to share on all occasions.